A full breakfast is a weekend treat. Use some of these tips for saving time and having it all hot at the same moment. If it were up to me, coffee and a slice of toast would be breakfast. I’m good with that most days. 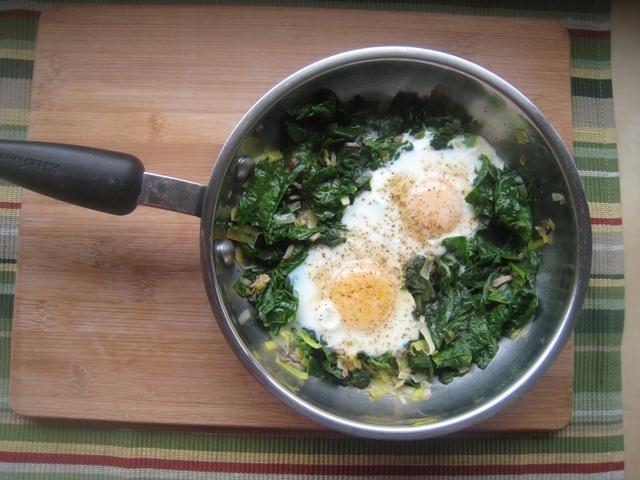 Unless I have the makings for those skillet-poached eggs and greens. Oh my! I could eat those every single day. Yum! Years of having babies and nursing babies have taught me to eat a better breakfast, so I now usually lean toward some kind of dairy and fruit to add to my toast. The fam? They want the whole deal. For them that means eggs, a meat, a baked good, and potatoes. Enjoying breakfast at a local diner is one of our favorite pastimes. But the cost can add up. So, if I cook it all at home, it’s a reasonable substitute. I don’t cook full breakfasts everyday, but I try to do it at least once on a weekend. Since I want to be able to serve everything reasonably hot at the same time, I use a few tricks to save time while I’m cooking to feed a small army. 1. Make your mixes ahead of time. I can’t tell you how much time I save when I prep baking mixes ahead of time and store them in the freezer. It’s always pretty sad when we run out. Thankfully, it doesn’t take more than a few minutes to mix up more. Don’t spend your time baking small batches of things. I can’t imagine the patience of Ma Ingalls cooking every child a pancake on Christmas morning — in one cast iron skillet! We’ve got a huge waffler as well as a large electric griddle for cooking up breakfasts. These are huge time-savers when I want to make many of one thing. I can make four waffles or eight pancakes at a time with these two small appliances. Make enough for everyone to have his fill. 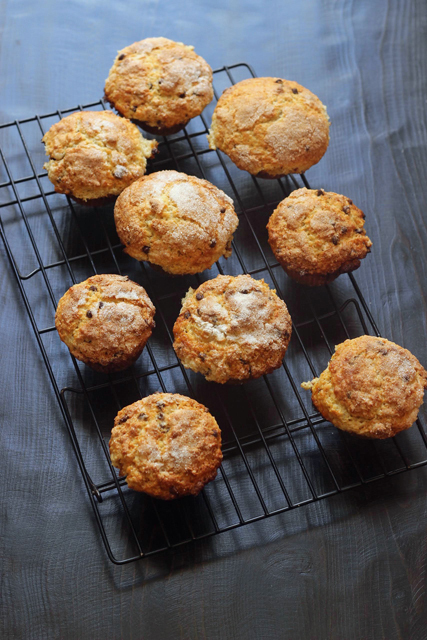 My Mix and Match muffin recipe makes 24 regular size muffins. If you don’t have a large toaster oven, you can use your regular oven to toast bread or English muffins. Get as much bang for your buck as you can! 3. Bake many things at once. If you’re heating the oven, make it do double duty. Bake your bacon and your egg dish and your muffins all at once — provided that you have a regular size oven. For years we had a Holly Hobby oven and it was hard to make it multi-task. But, if you can make use of the space and the heat that you’ve got going. 4. Limit your stove time. I don’t know about you, but standing at the stove first thing in the morning trying to keep track of frying eggs, splattering bacon, cooking hashbrowns and flipping pancakes is not my idea of a sunshiny morning. Instead, I limit the stove time so I can avoid that hot and bothered feeling. The pancakes are relegated to an electric griddle where an older child can do the flipping. The bacon goes to the oven. I cook the eggs. And the hashbrowns? Well, the panini press takes care of that! I’ve done this a few times recently with great success! The hashbrowns turn out nice and crispy and no one needs to babysit them. Love that! Cook hashbrowns quickly and easily and almost hands-free when you use a Panini press. This recipe is excellent for breakfast. In a large mixing bowl, combine the potatoes, olive oil, salt, paprika, and pepper. Toss to combine. In two or three batches, depending on the size of your press, spoon potato mixture onto the press and close tight. Allow to cook for 5 to 10 minutes, until desired crispness. Remove from press and continue with the rest of the potato mixture. Do you enjoy a full breakfast? How do you make breakfast prep easy at your house? I wonder if the Panini press idea would work with fresh potatoes.Also if it would work in a waffle iron (since I don’t have a Panini press) We usually peel and shred our potatoes and then dump them in ice water before frying. It does take a while so we tend to serve them only when we are having breakfast for dinner which is about once a week in our family. I does work in a waffle maker, for me anyway. @DawnJoy, do you think a George Foreman grill would work? @Victoria@Snailpacetransformations.com, I don’t know about fresh potatoes shredded. They are such a hassle to make. Bowing to you for every doing it. One of the few things that I always buy frozen. A commenter below is going to use leftover baked potatoes. I think that could be a winner, esp. if tossed with a little oil first. 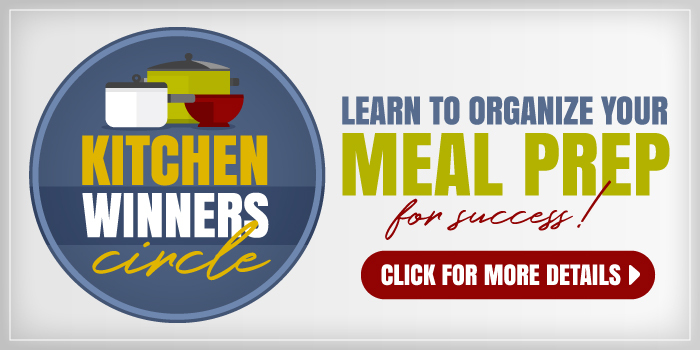 Use your crockpot!! I throw the whole potatoes in and cook them on low until they’re done. Then I wait for them to cool, shred them with a cheese shredder(the skin falls off. You don’t even have to peel them! ), and flash freeze them. If i can do it, it is not hard. Trust me. 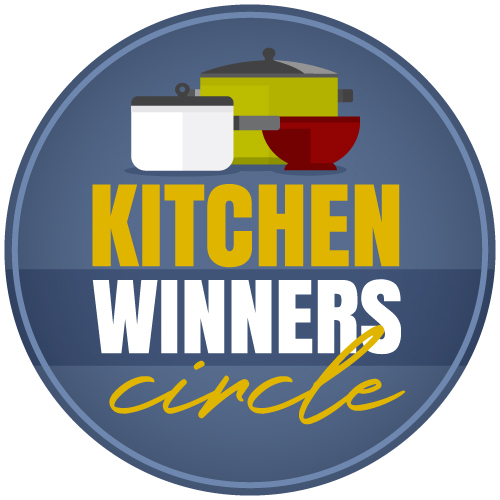 Crockpot also works well for doing a baked potato bar but not wanting to heat up the kitchen. 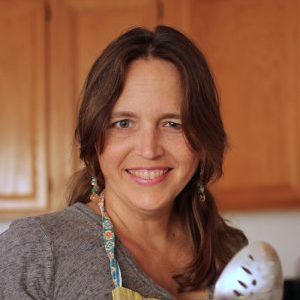 I like your tips for limiting stove time. I despise standing at the stove trying to make sure nothing burns. These are great tips! Love the panini press potatoes. Only, I don’t have a panini press… 😉 I started freezing baking mixes after find your blog. They are a real life saver. @Michelle @ Simplify, Live, Love, I’ve hear that it can work in a waffler. Awesome! You are going to be my boy’s hero. They love hashbrowns, but I don’t make them much because I hate to babysit them. Can you tell us what brand of frozen potatoes you usually use? I’m hoping to find something that’s just potatoes without added stuff…. @Ellen, I usually buy them at Trader Joe’s. I don’t really have a source for great ones. Fresh potatoes could be cheaper, but they’re such a hassle for hashbrowns. Wow, I love this post! I am so not a morning person amd often feel guilty about not being able stand the idea of the stove in the mornings. You give me hope that I might just be able to cook breakfast, thanks to all your wonderful ideas. Thank you foe your wonderful blogs. You are inspiring! Oh how freeing it is to hear others say they are not morning people. I love the thought of making breakfast for my feeling. But the thought and action almost never connect. What mix recipes do you use? I am always looking for a good versatile muffin mix that I can add what I want (berries or ‘stuff’) to and keep in the freezer. We bought a second griddle a few months ago. Either I do pancakes on both, 16 at a time, or eggs on one and pancakes on the other. With 7 kids it makes it so much faster, I tell everyone they should have one. What a great idea for the hash browns. I never make them, because I always have too many other things to keep an eye on. You always have such great tips and ideas. Thanks for your kind words. Our griddle is starting to show its age. Do you have one you really like? Jessica, I just wanted you to know that you are the BEST!!! Just in case someone else hasn’t told you that lately! (I know I don’t always hear it from my family……….) I love the idea of the hash browns in the panini maker! Actually, I think I’m in love with my panini maker………. 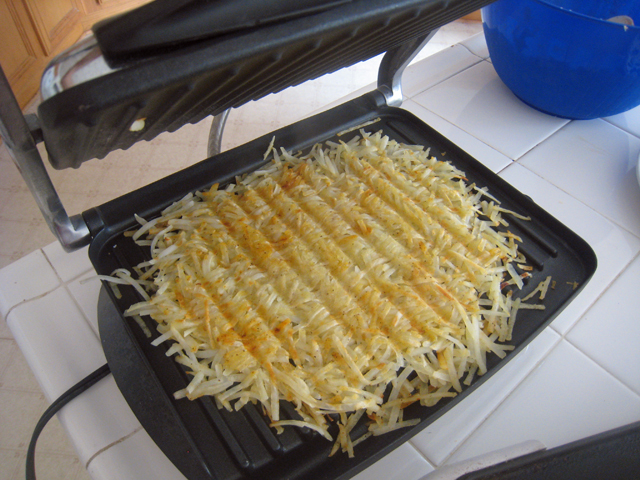 What a great idea to use the panini press for the hashbrowns! I’m always looking for ways our Cuisinart Griddler can earn its cupboard space. We also use it for quesadillas a lot. I’ll have to try it with some baked potatoes we had left over. I’ll just grate them up, follow the rest of the recipe and see how it goes. @Rachel, I’d love to hear how that goes. I think I would toss them with a little oil or butter so that they don’t stick and so that they get crispy. We tried this out today and we all loved them. The skins tend to flake off when you grate them, but I just crumbled them up and put them into the mixture of oil and spices, and also put in some sharp cheddar. Because cheese makes everything better, right?! My kids all love the crispy cheese that oozes out from the edges of quesadillas, so I figured it would kind of be the same. I wonder if I could use the George Forman grill?? I don’t have a panini press, but I do have a GF grill. Readers are saying on Facebook that they’re going to try that as well as a bacon press. you are a genius! i love my panini press. i’ve had it since we got married and it’s still one of my favorite appliances. i let irons, toasters, and even crock pots die and not get replaced, but if this thing ever goes, i’m not waiting for one to wander back into my kitchen. i’ll be ordering one right away. i’m so trying this next week. we are camping and this will make breakfast on that little two burner stove so much easier. I make pressed sandwiches in my cast iron skillet with another one placed on top….thinking I may try this with hashbrowns too….yum! Just wanna say I love the “Holly Hobby oven” reference. 🙂 Good times, fun memories! @Julie, let us know how it turns out. Hee hee…Holly Hobby oven. Too funny! @Ellen, yeah! Thanks for letting us know. Great idea with the Panini Press. I used to love frozen hash browns for breakfast. I was truly one of my most favorite foods. But we haven’t bought any probably in over a year. My hubby won’t let us (have you read the ingredients list?). I normally just crisp up some leftover mashed potatoes in lieu of the hash browns. It would probably work in the press too. Fishmama, you have given me a great idea for Passover fried potatoes! During Passover, Jews rival the Irish in the number of potatoes they eat, and it gets a bit dull. No regular flour allowed. Going to whip these up in my Panini press and serve with eggs – these are completely “kosher for Passover” and use regular ingredients. How high do you heat your panini press when you make these? Mine has an option of high, medium, or low. I think mine is always on high. But, a reader mentioned that hers burned on the edges, so maybe it’s different among panini presses. I would try on medium and then adjust. Just yesterday I was thinking there’s got to be a waffle iron that can make more than one at a time and today your post shows up in my Facebook newsfeed. What brand is it and where did you get it? How many of these do each of your kids eat? To me, that’s just one waffle because my 7, 8 and 9 year old will eat two full ones each. I have the round Belgian waffle maker, so the shape is different, but it looks like the overall size is different. The same, not different. Overall size is the same, even though the shape is different. It would take 12 sessions on this iron to give each family member the quantity they like to eat.